Simplifying this circuit using optotriacs? X1 & X2 are the Opentherm wires (doesn't matter which); the IN and OUT go directly into the Arduino's GPIOs. Finally, the VCC goes to Arduino 3.3 or 5v and the GND to Arduino ground. • any of these parts will the same or better job. That circuit provides a DC current shunt to an AC rectified source and series load from a 24Vac furnace transformer. All it has to drive is a logic driver to activate the furnace, the same way a reed relay might work. Now, whilst it does seem that the original poster of the question asked for more clarity on how exactly the optotriacs could be used in this situation, I feel the person answering does not give a sufficient enough answer for the skill level of the person asking. Similarly, I am not super skilled with electronics and found the explanation of the proposed solution rather lacking. As a result, I am asking this question. My question is: How can the above circuit be replaced with a simpler solution? Is all that circuitry required to allow the communication from 5v DC to 24v AC and back? The answer linked above mentions optotriacs, how could they be used in this situation to simplify the circuit? Browse other questions tagged arduino circuit-design opto-isolator rectifier or ask your own question. Does this prototype match the schematic? Can I replace this circuit with an IC? 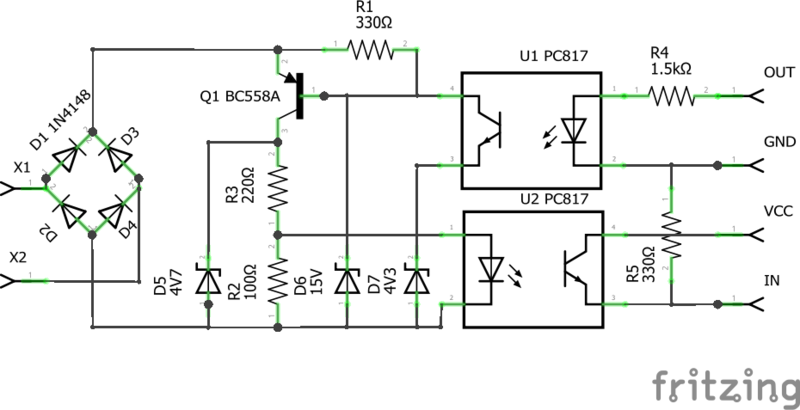 Difference between optoisolator(optocoupler) and solid state relay? LED light dimming, TRIAC vs PWM?